To kick off the new series Free Form Fridays, Mike combined the free jazz sounds of Concurrence (Greg Bryant, Paul Horton) and the improvised overhead-projector visuals of Dig Deep Light Show (Brian Miles, Scott Sanders, Dave Shambam). Concurrence recently performed with Nasheet Waits at the Nashville Fringe Festival. Dig Deep Light show wowed art-crawlers at Saturday’s Bring Your Own Beamer show at Track One. Seeing them together might just make your brain explode. After the show, take a few laps around the Parthenon to clear your head. The Concurrence/Dig Deep performance takes place at 7:30. 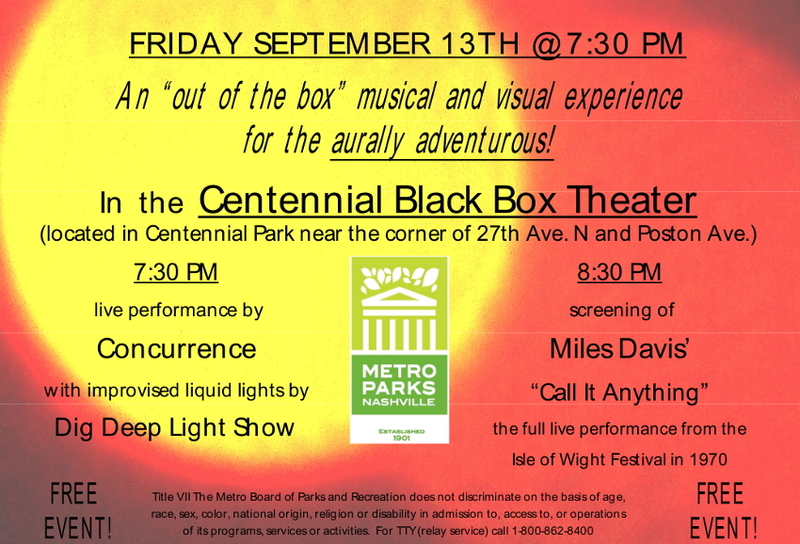 At 8:30, there will be a screening of Miles Davis’ “Call It Anything” live at the 1970 Isle of Wight Festival. Oh, and the Free Form Fridays series is FREE! Located in Centennial Park near the corner of 27th Avenue North & Poston Ave.